I Eat My Books, Do You Eat Yours? I have too many cookery books. There, I’ve said it. Despite two major clear outs in the last couple of years, when lots and lots of cookery books were given away to charity shops and fundraisers, the assigned shelves are overflowing. Books are stacked two deep, with extra ones squeezed on their side above the others. Others sit in stacks on the dining room floor, living room coffee table, and even lost amongst the papers on my desk. I’m aware my collection is tiny compared to some, numbering at only 150 or so against the many hundreds some of my friends and acquaintances report. And yet there is still an argument to be made that I have too many. There are many that I’ve cooked from only once or twice; some that I’ve never cooked from at all. Often, I don’t even remember that I have a particular title, only to exclaim in excitement at its rediscovery during yet another session of tidying. Surely, a cookery book exists to cook from – or at the very least, to inspire and inform one’s cooking? If I consistently forget about the book, do I really need it at all? Of course, that’s my rational head talking rather than my emotional heart, which clutches these books to itself with all the fervour of an addict, wild-eyed in distress at the thought of parting with favourite tomes, regardless of their practical use (or not) in my life. My emotional heart says I certainly do not have too many cookery books, thank you very much! Still, it’s true that I haven’t been making great use of my collection. What if there were a way of making my collection more accessible to me? What if there were a way of reminding me easily about all the books that I have, and better still, of all the recipes contained within them? What if there were a way of flicking through recipes by book, author or ingredient without the need to pull every single book off the shelf? That was just the kind of thinking that occurred to sisters Jane and Fiona a few years ago. Jane came up with the core idea for Eat Your Books after realising that, despite owning a lot of cookbooks, she would go online when she wanted to find a recipe quickly. 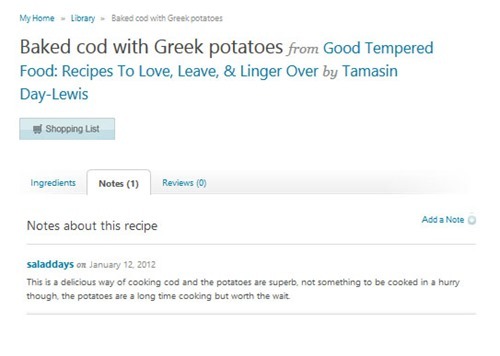 She goes on to explain, “It made me wish I had a searchable index of all my cookbooks. I seriously considered creating my own database then realised there must be lots of people like me around the world who feel they don’t use their cookbooks enough as it takes so long to find recipes.” So she talked through her idea with sister Fiona, who has a technology background and the pair decided they had the makings of a good business. So that is Eat Your Books: a fantastic online service offering exactly what I describe above – a way of making my collection of cookery books more accessible and therefore more useful to me. 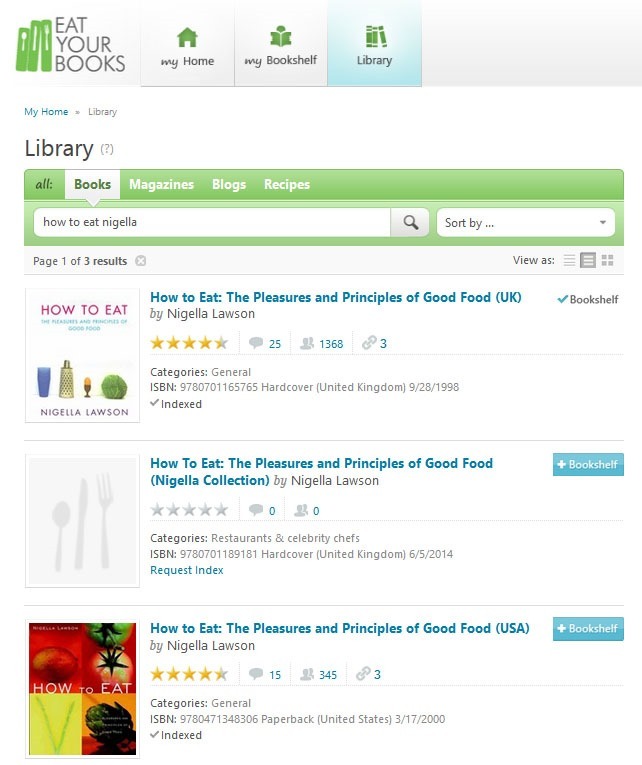 Launched in 2010, Eat Your Books is already hugely popular with many tens of thousands of users around the world. It’s particularly successful in US, Canada, Australia, New Zealand and is growing its user base here in the UK. 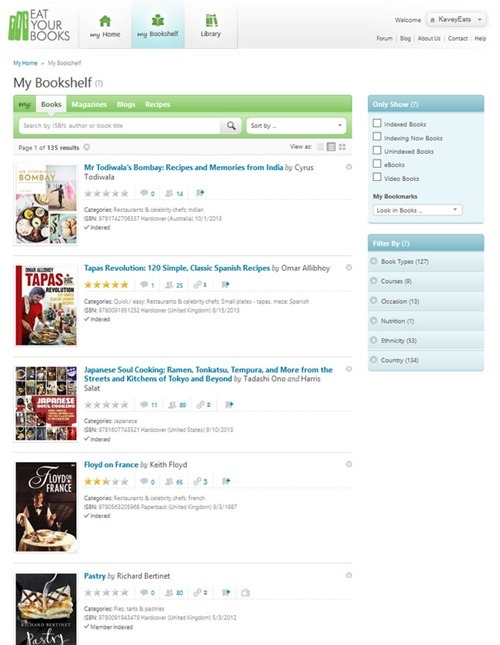 Eat Your Books allows you to create a virtual bookshelf of all the (English-language) cookery books you own. Once that’s been created, it’s a matter of a few clicks to search through all the recipes in all the books on your virtual bookshelf by whatever keyword you like. 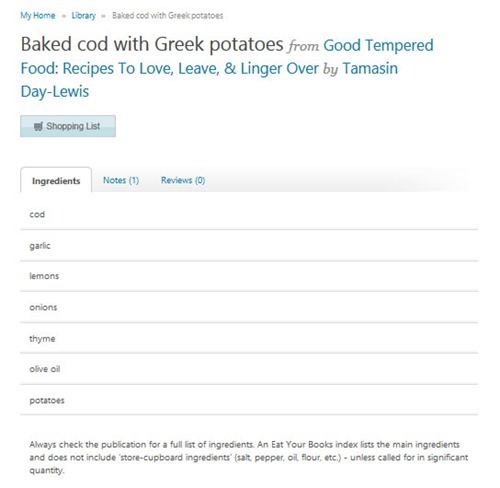 All the matching recipes are listed, and when you find one you like, you know exactly which book to retrieve from your real bookshelf in order to read the recipe. In order for the search tool to be useful, every book must be indexed by hand so that recipes are keyworded only for the ingredients, techniques and descriptions that are key to each recipe and likely to be used to find them. Auto-index tools tend to list too many false positives in their search results – a search on chicken might include every recipe that uses chicken stock, for example – and are therefore not an option when creating a truly user-friendly database. New books are being added all the time, with a focus on adding the big sellers as quickly as possible. Although I first joined a couple of years ago, it was only a couple of months ago that I finally invested the time to go through my entire real life bookshelf and add the titles to my personal Eat Your Books account. I had expected to find many of my titles missing from Eat Your Books’ database, but actually there were only a tiny handful that I couldn’t find, and they are pretty obscure titles. Judging from my collection, the database seems pretty comprehensive for books released during the last 30 to 40 years, at least. When building your bookshelf, searching can be a little tricky for some titles but most are very easy to find. For some books, searching by author or title works best; for others, I entered the book’s ISBN. For certain books, Eat Your Books lists multiple editions, so you might need to check the front cover image or ISBN number of those listed in the search results, to make sure you add the right one. There’s also an Import Books feature (available to paid members only) which lets you enter a list of up to 500 ISBN codes in one step. You can generate this list by way of a barcode scanner app on your smartphone. After populating my own bookshelf, I was keen to start searching through my recipes. You might remember a recipe post (for cod baked with chorizo and potatoes) in which I mentioned an error that resulted a delivery of 4 kilos (rather than 4 small pieces) of beautiful Norwegian cod, much of which is still sitting in my freezer. After entering all my books onto My Bookshelf, I was delighted to discover that I have 78 recipes for cod contained within the cookery books I own, many of which I’d never have thought to turn to when seeking a recipe. Results can be sorted by title, author, publication date and user rating. To see whether a recipe suits what you’re looking for, click the title to see a list of the main ingredients and any notes that have been added. The more books you have, the more recipes will be listed but you can filter your search results by ingredient (very handy if you have an allergy to cater for), recipe type or course and ethnicity. I’ve filtered below to exclude salt cod, baby food, sauces and dips, and pies and pastries, to bring my list of cod recipes down from 78 to 31. Additionally, you can also create your own bookmarks with which to tag books and recipes, to help you further categorise them above and beyond the filter definitions. I’ve created a “Made” bookmark to record recipes I’ve already cooked and another called “Shortlist” to identify those I’m keen to make soon. Just this service alone would, quite frankly, be worthwhile – for me and for anyone who owns an unwieldy collection of cookery books which they don’t make the best use of. There are also a number of other services on Eat Your Books which are deserving of mention. There are currently 73 food blogs (of which I’m delighted to be one) listed, with recipes indexed and searchable in exactly the same way as published cookbooks. If you subscribe to a popular food magazine, the title can be added to your bookshelf too, giving you a quick way to search through the recipes in each issue. New issues will automatically be included in your future searches and you can add any past issues you’ve kept too. 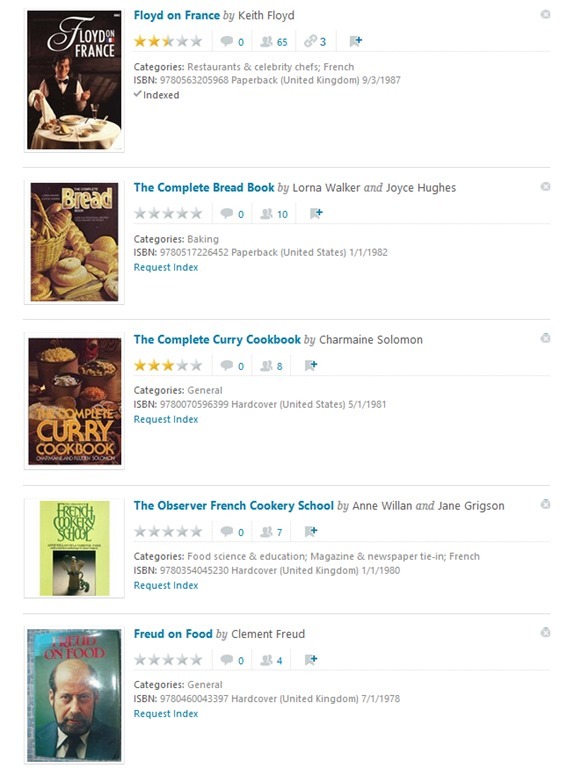 In addition, there is a huge library of online recipes you can access, even if you don’t own the books. These are recipes that publishers and authors have officially permitted to be published online, and Eat Your Books indexes them and provides a direct link to the content. On the rare occasions you own a book that isn’t already indexed, you can index it yourself. Though this is quite a big task, it does make your virtual bookshelf more complete, and also benefits the wider Eat Your Books community. There is a shopping list function, but it’s not currently advanced enough to be useful as recipe indexing doesn’t currently list amounts. If developed further, I can see this becoming a valuable tool within the site. So the next big question is how much does it cost? The answer depends on how much of the functionality you want to access. Some some parts of the site can be accessed without registering and if you create a non-paying account you can access quite a lot of the site. Full functionality is reserved for those who buy premium membership, which is priced at US$25 a year or US$2.50 a month; (at today’s exchange rates that’s £15 / £1.50). Before you dismiss the idea of paying for an online service, let’s just pause to put that into perspective – £15 is the cost of a single cookery book a year and if you make proper use of the service, will help you maximise the benefit of owning all the books you already have. 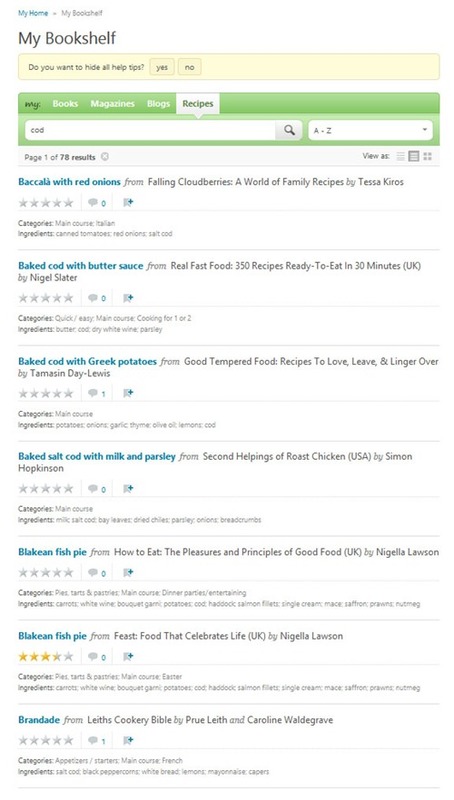 Anyone can search the recipe database. Don’t forget that, for books and magazines, the actual recipes are not reproduced on the site – rather Eat Your Books is a sophisticated personal catalogue and search system. But users can filter the results to show only those recipes which are fully available online, linked via the site. Anyone can read the blog, and subscribe to it using RSS. Non-paying members can add up to five books and five magazines to their bookshelves (and self index as many additional books as they like, provided the titles are not already available on the site). Paid members can add as many books and magazines as they like (and self index as well). Paid members may also use the Import Book function to add large collections of books more quickly. All members can add unlimited blogs and online recipes to their bookshelves. All members can upload their personal recipes to the site. 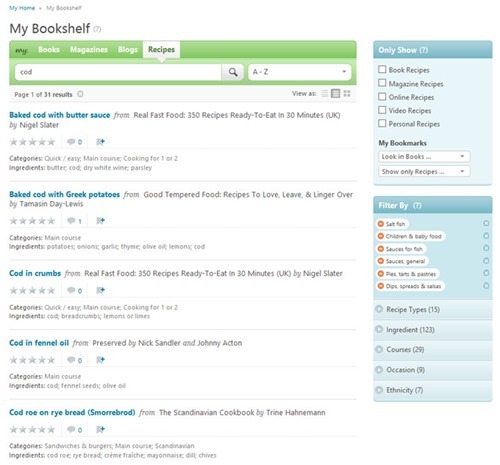 All members can create bookmarks (with which to tag items on their bookshelves) and can add notes to recipes and books (including personal notes). All members can make use of the EYB discussion forum. Paid members will not be shown advertising when visiting the site. These adverts are a way for EYB to subsidise the cost of non-paying users. I asked Jane to tell me a little about the first few years of creating Eat Your Books and what they are planning for the service, next. Kavey Eats received a complimentary subscription from Eat Your Books. 58 Comments to "I Eat My Books, Do You Eat Yours?" I love em all! My current favourite though is “Taste” by Sybil Kapoor, picked up in a charity shop a few weeks ago. It is based on the balance of the elementary tastes sweet, salty, bitter, sour and umami, and is quite literally an education. Sounds like a lot of work, but well worth it in the end, like you I have loads of books that I might cook only one or two recipes from, and I usually forget which book the ones I like come from. I go through phases, but using the important “page splash index” my all-time fave is an Australian Womens Weekly Italian cookbook. This sounds like a really amazing product – I’d vaguely heard of it but not really understood what it did. Cooking AND databases? Life doesn’t get any better. Favourite book right now is a toss-up between Uyen Luu’s My Vietnamese Kitchen for opening up a completely new world, and Tom Kerridge’s Proper Pub Food for making a familiar one exciting again. Pick any recipe from either one and you’ll be very, very happy. I still return often to Delia’s how to cook. It;s just so reliable. I’ve liked your page on Facebook. My name over there is Judith Lark. My current favourite book is River Cottage Every Day by Hugh Fearnley Whittingstall. How to pick a favourite cookbook?? I read them like novels, and want to hear the author’s voice in the recipes, so for that I think it’s going to be Nigel Slater’s Kitchen Diaries. I love the seasonality of it. And, you know, Nigel Crush innit? What a fantastic idea – it sounds like a really useful service! My favourite cookbook is Real Fast Food by Nigel Slater. The food stains show how well-used it is! DEEPAK CHOPRA,THE BOOK OF SECRETS. IT GIVES YOU SOMETHING YOU WON’T LOSE. I love the Hairy Bikers cook book family meals that are easy to make and dont cost the earth. My favourite cookbook is “The Passionate Cook” by Canadian chef Karen Barnaby. Using this book brings back great memories of holidays in Vancouver and a visit I paid to her fabulous restaurant at the Fish House in Stanley Park. My fav is a hand written book by my French grandmother. My current favourite cookbook is Rick Stein’s Far Eastern Odyssey as it has loads of authentic Thai, Sri Lankan, Cambodian and other East Asian recipes in it as well as where to source some of the harder ingredients. One of my favourite recipes is the pork and pineapple curry. Yum! My favourite recipe book is probably “Greek & Cypriot Cookery & Wines” ISBN 960-540-176-2 because its full of great recipes that I’d actually want to eat and not a few recipes that I want, padded out with loads of things that no one would ever want. It would be quite tricky to pick just one, and I don’t have a top favourite. I love In Nonna’s Kitchen, as this is a part-recipes, part-life stories of the Italian grandmas who share their cooking secrets. A very enjoyable read. I go back, time and again, to my 1985 edition of Claudia Roden’s A New Book of Middle Eastern Food. The splattered (and some no longer legible) pages are a testament to my constant use of this erudite, practical and entertaining book. Every time I open it, I learn something new. A joy to read and a joy to cook from. The one cookbook I’d never part with. My favourite cookbook is one I have had about forty years “Good Housekeeping Cookery Book”. It explains everything from basics which I need as I am not a natural cook. I love this book because it taught me how to make authentic gujarati food for my husband. What a great idea. I could definitely benefit from this service – and if I don’t win the competition, will have to sign up! Favourite cookery book? Blimey, that’s a touch call. My old copy of Delia’s Complete Cookery Course is probably the most battered and gravy-stained on the shelf, but then I also really like Lucas Hollweg’s Good Things To Eat, Tom Kerridge’s Proper Pub Food and Marcus Wareing’s and Chantelle Nicholson’s Gilbert Scott book. I love the Hawksmoor At Home book too, and the original Cinnamon Club collection: they’re both good reads as well as fine collections of recipes. But I guess I have to pick one right?! In that case, at this moment, with (world) BBQ feature just delivered and just a week past Grillstock, it’s Edward Lee’s Smoke & Pickles. I think probably its Big Flavours & Rough Edges: Recipes from the Eagle (later republished as the Eagle Cookbook) because its got a great variety of recipes, its about simple things done well, it reminds me of when I really first started to cook lots and lots and the original has really beautify drawn illustrations. I think i have about 10 books I return to as regulars the rest are for dipping into for inspiration. I have The Dairy Book of Home Cookery from 1978, which my Mum bought for me from the milkman. It is well thumbed and looking the worse for wear but is great for basics. The grubbiest page is the Curry Sauce recipe which I used to make long before the bottled curry sauces were thought of. I have just noticed there is a recipe on the same page for Sweet and Sour Sauce, must try that sometime! My favourite cookbook is called ‘Dinner Lady’ by Jeanette Orrey. The food is so simple and easy to make and the kids love the recipes. I love this idea so much. I think I must have around 150 cookery books too but generally turn to the internet when I’m stuck for inspiration. Favourite book? So hard, but probably Simon Hopkinson’s Week in Week Out – it was my first serious cookery book and I still love cooking from it. And I already follow you on Facebook – Jennifer Langley. The Bero Cookbook, Ive had it since I was 13 that was 43 years ago. My mother had one before that!!! My favorite cookbook at the moment is 1000 Vegan Recipes by Robin Robertson. I follow you on Facebook as Sheila Johnston Shealey. My favourite cookbook? That’s a toughy… A real favourite is my forts ever one, my beloved Be-Ro book, my go-to favourite is Leiths Vegetarian Bible which is full of stunning flavour combinations and inspiration, and my current favourite is Honey & Co, delicious a Middle Eastern food beautifully presented… Eeek, maybe I have too many cookbooks too? I don’t have a lot of cookbooks, probably about a dozen or so, mainly because I’m quite fussy with them. I tend to shy away from the mainstream celebrity cookbooks because they rarely inspire me, the exception is hughs 3 good things which has inspired me numerous times, I have nigel slaters kitchen diaries, and a complete italian cookbook. I tend to look at cookbooks that have techniques rather than just recipes, because it helps me become a better cook, recipe books are just that, a list of recipes you can just follow and, yes make something nice, but what to do after that? Once you have exhausted the recipes in the book what are you going to do next? SO many favourites. It’s almost impossible to pick one. However, plumping for All You Can Eat by Tamasin Day Lewis. If I’m looking for a recipe for practically anything it’s in there and it’s peppered with the authors wonderful head notes which are worth reading alone. The recipes are scrumptious – usually the best version of cooking anything. Secrets From a Vegetarian Cooking by Nadine Abensur, its the first cookbook that got me seriously into cooking and seeking vegetarian recipes that were different and innovative at the time. I very much love Madder Jaffrey curry bible! It has changed the way I think about spices. ‘Nigella Bites.’ It’s possibly the only cookery book I own that I have tried every recipe from. The pancetta spaghetti is my favourite comfort supper, and the ‘mozzarella in carrozza’ (A very oozy toastie!) is my favourite Saturday breakfast.